Recently uploaded, here's an hour-long interview of Peter Sellars with Simon Halsey (chief conductor of the Rundfunkchor Berlin) from April 2010 in the Berlin Philharmonie all about Bach's early music masterpiece, Matthäus-Passion. Happy Easter! Opera Chic was among one of the kewl kids @ the Wednesday, August 13, 2008 U.S. premiere of Kaija Saariaho's La Passion de Simone, and can report that the 75-minute long oratorio lived up to all of her expectations. OC digs la Kajia for so many reasons, because she comes highly recommended from Esa-Pekka Salonen…who is still teh mang, and because she was the first girl to crash the Salzburg boy's club and stage one of her operas there. La Kajia has so many other cool things about her -- she's a close friend of Dawn Upshaw, and anybody's who's friends with Dawn is friends with us, too. She writes -- especially now that she's left electronica more or less behind -- elegant little miniature pieces that are blessedly unafraid to sound not-difficult, not-Boulez, not-Darmstadt. And this elegant approach, this talent for understanding the life of small things is also Saariaho's main limitation -- you have to be Debussy in order to write music with moisture over a spider's web the way Saariaho tries to do -- and she's not exactly Debussy. She writes with great precision, and she's never too easy, and never too New Age-y, but the risk is there -- may the Muses bless her for the humanity that informs her works – a humanity that captures you the way it captured Dawn, for example, who knows about such things -- but Kaija -- unless she's at her very best-- ends up more in the business of creating affecting moods than creating great music. That said, OC will resume a more succinct review tomorrow when she's had a chance to replay the glittering, twinkling ambiance that la Kaija wove via the orchestra, melted with hair-raising glissandi, the gentlest of pianissimi, and frantic, scrambled climaxes. Saariaho reminded OC how important it is to not harsh on one’s mellow -- and with that, she’s going to turn out the lights, spark a few Annick Goutal rose musquée candles, wrap herself in her black Pratesi cashmere robe, and sip a mug of Fortnum & Mason elderflower infusion. Stay tuned for all the highlights. La signora Dawn Upshaw -- mystical Unitarian, corageous survivor, proud disciple of the Upshaw Family Singers, radio DJ, polite endurer of dense journalists, friend of the late Lorraine Hunt Lieberson, and soprano assoluto of magical wonders -- with dancer Michael Schumacher will perform the New York premiere of La Passion de Simone at the 2008 Mostly Mozart Festival next Wednesday. Kaija Saariaho’s "musical journey in fifteen stations" (as in "stations of the cross") is directed by Peter Sellars, with text by Amin Maalouf. NPR has plenty of audio, and other good stuff. He set Mayakovsky's The Bedbug in an American supermarket, he led the audience in a procession through the mean streets of Cambridge, Mass., only to find Boris Godunov's body in the basement of his college dorm. He cast a bunch of old newspapers as the lead of When We Dead Awaken. He did the Ring with puppets, he set Macbeth in a hallway, Antony and Cleopatra -- and Giulio Cesare, too -- in a swimming pool, Nozze di Figaro @ Trump Tower, Don Giovanni in Harlem and Così Fan Tutte in Despina's Diner. He considers, quite rightly, Lorenzo Da Ponte to be the most merciless playwright who ever lived. The more he gets hated on (or dismissed as a charlatan), the more Opera Chic comes to like even more that crazy spike haired old Harvard boy, il maestro Peter Sellars. Appropriately, someone has now made a documentary about him. 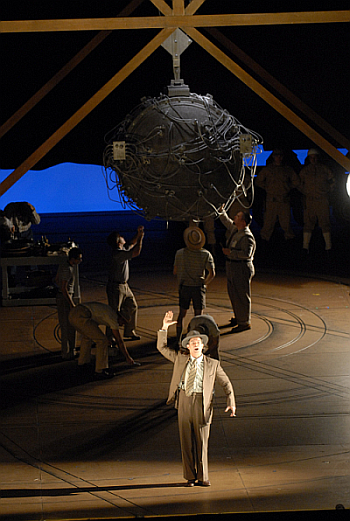 Gerald Finley, as J. Robert Oppenheimer, in the Lyric Opera of Chicago's production of John Adams's Doctor Atomic, directed by Peter Sellars.